You may recall a few weeks back I decided to copy a magazine picture to challenge myself more or less and to practice my photography. It went pretty well, and I had fun with it. be a magazine copy cat! How fun and very easy. You know, while I was doing this challenge, I got to thinking. I really am dedicated and committed to my blog. I may not post everyday over the summer, however I still remain active, and loyal to my readers. I never dreamed I would come this far, be in a magazine, and make tons of new friends. Really, never dreamed it. Although, I tell my boys all the time, you can do anything you set your mind to do. I suppose, that is what I did. I really wanted to learn to design, and create the world around me. I have learned immensely through blogging, and through having an open mind. Sometimes, I admit, I had to put my foot down, take breaks and just reevaluate what I wanted. I have always known, I want to succeed in whatever I did, and whatever makes me happy, that is true success, being happy. I am happy to report, I am exactly where I want to be. I love the newbie party, it really is what motivated me to keep going. and I will continue to the best of my ability. I have a new option under my header in which you will see, I have taken away the feature option. I knocked off a lot of requests, and quickly realized it would take me years to feature my almost 200 requests and going. hey I never claimed to be. WHAT is working for me is the weekly features from the newbie party. I feature three at a time, and Mr. Linky helps with that. So if you are new, you want to jump in there,you never know when you will be featured. I think you should try a magazine copy cat challenge sometime. I may just host a linky party for one. I feel confident to offer this to my readers at this time. I feel that even with the increase of friends, I have not forgotten all my old friends. You can all vouch for that. But I do try my best to make some visits when I can. Cute copycatting. Wow, your shoes are high. I can't wear them that high. Good luck. You're doing great! Thanks for keeping up with us too! Thanks Melissa for the crit...this is how we learn in the process. Your the best Deb, when I came from one blog to another you made me feel right at home, I always think of that when I read your comments on my blog! I think the linky party would be great I'd love to be part of it and copy pictures and post them...neat idea! Love yours! I love your copy cat's! I also love your originality, as well and you have lots of that! A copy cat link party might be fun, Debbie! What a great idea! I've not seen anything like that and how fun would it be to see the different magazine coers we'd all choose to copy?! I need to get the big girl camera out and do more with it. I use my little point and shoot for most of my blog photos because it is easy to pull the card out of the camera and plop it into the computer slot. Lazy, lazy me. What a great idea! I'd never have thought to do that. 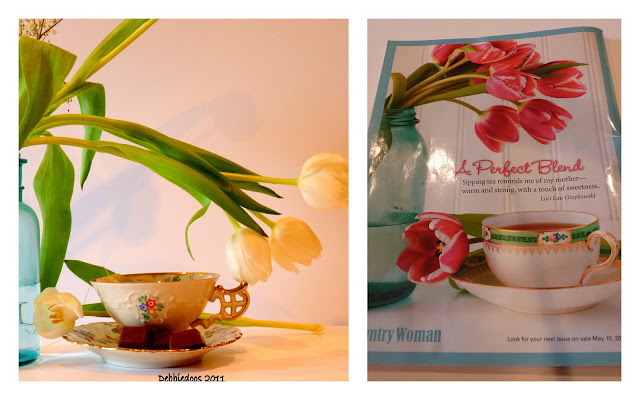 I love staging my Etsy photos, but that gets pretty boring after a wile. I'd love to challenge myself and try a cover. Debbie, you are one of the most gracious hosts out there. You encourage and inspire. I love your newbie party and think a copycat linky would be a great idea. Your photos and display are fantastic. What a perfect idea. I could even play on the copy cat magazine one. But, let's not make it that pile of wood, OK. Color please. By the way, you have out done yourself on this one, deb. Go for it Debbie! This will be fun to see how it works out. I think 3 months is a good trial. Whenever I make a new product for my booth I only make 3-4 until I am sure it will sell! You put so much work into your blog a little extra cash is well deserved! Great job with the copycat! I love all the texture throughout your picnic spread. I can confidently say your newbie party pushed me over 100 followers quicker than I thought possible. Thanks so much for hosting it each week for all the newbies out there. It's such a great way for my no longer new self to find some great blogs. You find so many ways to keep it fresh and fun. Your copy cat version is great! You rock, Debbie ... attitude, outlook, creativity and friendship. 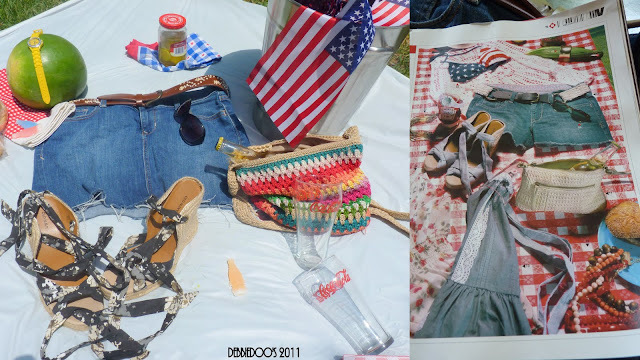 Love your copy cat look and think that a copy cat linky party would be FUN !! Oooh, a copycat linky party sounds fun! Always do what makes your heart happy! :-) These are very good photos. I haven't been around very much...been a rough week. What a fun post great job. I JUST looked at your sandals at Old Navy. they were on clearance but only had little bitty sizes:(. I would love practice doing these kind of shots with my camera. Thanks for all you do! I never would have thought of copy catting a magazine photo- another of your brilliant ideas! Nice job! My days of those high heeled shoes are "over". :-D I learned early on, blog when you want and about what you want and Do Not feel/think you have to post about a certain thing or at a certain time. It is you blog - take control. Looks great Debbie!! What a good idea, I'll definitely have to try to do a magazine copy cat myself sometime. I love your blog! And I think that a copycat linky party would be so much fun! Take care of yourself! So interesting, just before I visited your blog tonight I had posted on mine about not having time to blog. Although I'm new at it sometimes I feel like giving it up because I don't have the time it deserves. Then I remind myself it's about fun and making new friends. I just feel guilty when I know I have followers and don't post anything for a while. I know I certainly enjoy reading yours because I always find something fresh and new. Thanks for inspiring me, you are awesome! Like all the others have said, you are a great copy cat! Awesome job...the colors just pop out at you too. Great post! Looking forward to the party next week! You did a great job, Debbie. I like the first picture the best, although they are both good. I think it's a wonderful idea to have a meme party doing that. Once again, I like your interpretation better than the original. Your colors have a more "summer-y" feel to them. I'm hoping that if I touch my computer screen while I'm looking at your blog then some of your creativity will rub off on me! That is a great idea,we all have magazines! !..and I have to tell you(I don't know how you do it all)but you continue to amaze me and you have not forgotten your ole bloggy friends along the way,"your awesome" "our" blog-bud(friend)!! Deb- I think you are doing a wonderful job of "keeping up"...and I think you are very connected to all of us. Love the idea of the copy cat linky-thingy. I think that would be fun because a lot of us copy things from magazines with our own twist on the idea. Now that's a fun, summer lovin' copycat photo! I think a copycat party would be a great idea. Debbie, you keep up just fine. Sometimes you need to enjoy life too (or else you'd have nothing to blog about! LOL) You're one of the best bloggers around. You're a pioneer in this newbie thing. So many, including me, owe so much to you. You're almost at 2000 followers for heaven's sake, you're obviously doing something right! I like how you 'copy cat' the magazines. Your newbie link parties are the greatest. I enjoy them. I like how you are now featuring 3 each week. this is a great idea. need to practice! i love your copy cats pics, in the picnic one the only thing that get confusing are the shoe laces, otherwise would be perfect. my favorite is the granny's bag and the coca cola glass. great color details! thanks for all your help and input, thanks for the newbie party. i can't believe my 6 months will be up soon and i'm way over 100 followers now (350+!!!!!) for sure i owe you a lot!! well, i did quite some blabbling myself now.... ciao & grazie :), d.
Love this copycat idea! How cute!